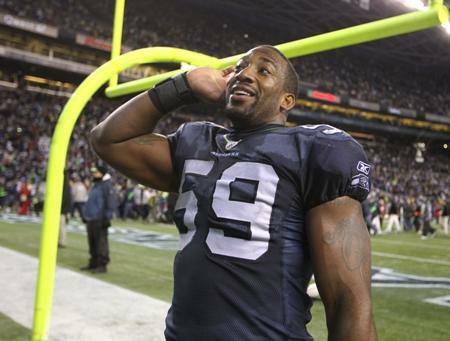 Seahawks linebacker Aaron Curry talks with fans at the end of the playoff game against the Saints Jan. 8, 2011, in Seattle. Curry's $60 million/5 year rookie contract is a reason why NFL owners want a wage lid for rookies. The current collective bargaining agreement expires March 4. All-day meetings scheduled for Thursday were abruptly canceled – raising doubts the two sides were any closer to reaching a compromise. KPLU sports commentator Art Thiel says there are legitimate issues on both sides that need to be hammered out. The owners want a cap on rookie wages. Art says Seahawks linebacker Aaron Curry is a prime example of why. Curry was the fourth pick overall in the 2009 draft and signed a $60 million/5 year contract. Art calls that "ridiculous" and says Curry will never live up to that kind of money. He says the rookie wage issue needs to be resolved or it will ruin player payroll scales. NFL owners want to get cost certainty on the labor front because they're putting a lot of their money into a fund to help subsidize the building of new stadiums, so they don't have to ask the public for money. Art says this is the way it should be. "The stadiums are getting so expensive that the owners need some player salary relief if they are going to continue to fund stadium construction. Anything that takes the burden of building stadiums off the taxpayers' backs, I'm for. But the owners have got to do it in a very difficult economic environment. Nobody wins if the players walk out or are locked out." Art thinks if a work stoppage were to happen, it wouldn't have a huge immediate impact since we're in the offseason. He expects a resolution before training camp or the start of the new season would be put in jeopardy.